Computer accessories are rarely designed with the ergonomics of the human body in mind. Function, price and looks are all prioritized, while our wrists and backs suffer as a consequence. For those us who sit at a desk and type all day, the possibility of developing Repetitive Strain Injury or Carpal Tunnel Syndrome is ever present. For some of you, it’s probably too late to do anything except manage the pain. In either case: the Evoluent Wireless Vertical Mouse 4 promises to alleviate the strain a typical mouse can put on your forearm. Let’s take a closer look, and evaluate that claim. At the end of this review, we’re giving one away to a lucky reader. 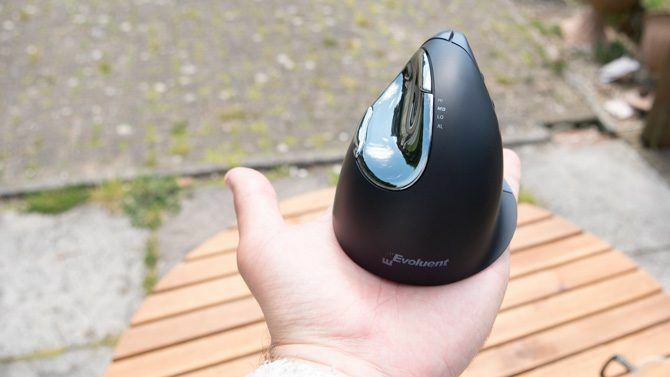 The Evoluent Wireless Vertical Mouse is available now for under $ 100, in right or left handed configurations, as well as small and standard size. We tested the right handed, standard size–their most popular model. If you’re buying a mouse to help prevent or ease the symptoms of a wrist strain injury, the looks of the device are probably not that high on your list of requirements. Which is good, because the incongruent design messages and mixed materials aren’t really something to shout about. A large shiny chrome pad sits on the left hand side, where your thumb rests. This is plastic, and it’s likely the chrome paint will wear off after a while, as some Amazon reviews have noted. 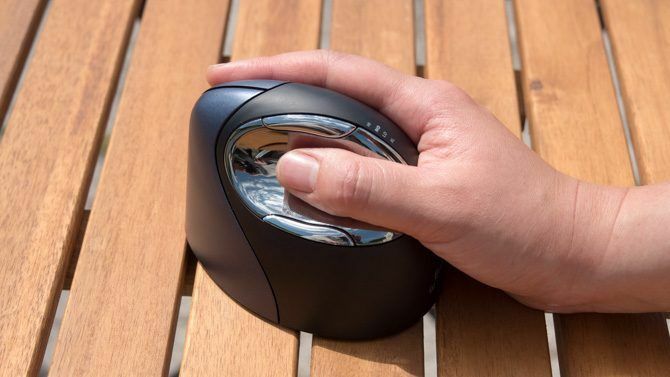 The majority of the mouse body is a slippery matt black texture that loves to expose greasy finger prints. I wouldn’t mind the fingerprints so much if it were a non-slip rubberised surface, but it isn’t. The buttons are different again: a metallic blue. The mouse wheel is rubber, with staggered rest stops so you can feel every 10 degrees or so of rotation. The Evoluent logo lights up blue when active, and on top of the device, a small green LED indicates the current pointer speed. On the base of the device you’ll find an embossed signature of the creator, Jack Lo. No, I’ve not heard of him either, and it comes across as a little self-indulgent design step that needlessly adds to manufacturing costs. My biggest out of the box complaint is how slippery the body and chrome pad are, to the point that I immediately dropped it when unpacking. The instructions note that when trying to lift it up, the device should be tilted first. 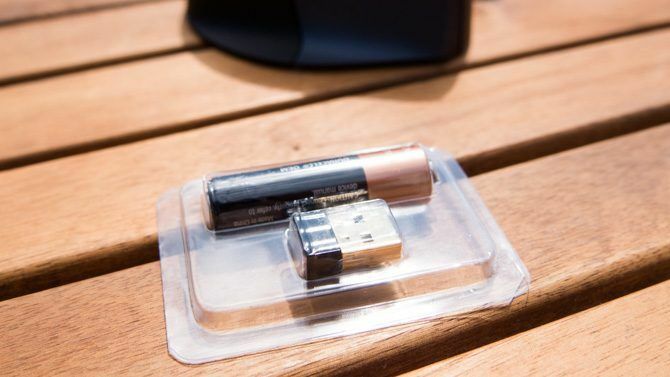 The mouse is powered by a single AA battery (included), which slots into the base at a curious 45 degree angle. I appreciate the use of simple AA-batteries in any tech. 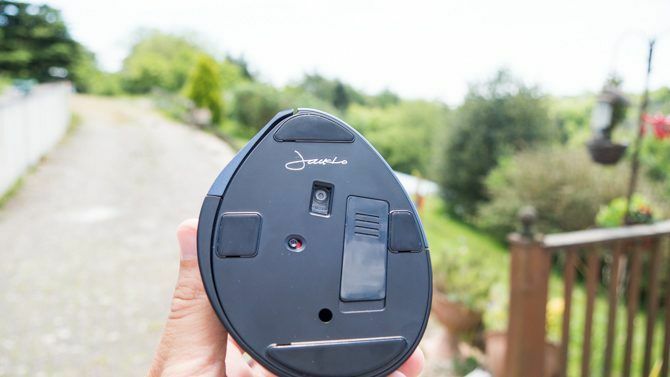 Built-in Lithium Ion batteries tend to degrade significantly after 2-3 years. One might call that planned obsolescence. If the device uses AA batteries, you can replace them for new ones without assistance from the manufacturer or a third party repair service, so kudos on that choice. The lack of a USB port for wired override is a missed trick, though. I often plug in my trackpad and use it while it recharges, or if the wireless connection has decided to play up, as wireless things are wont to do occasionally. The standard size measures 8cm tall, 9cm wide at the base, 11cm in length, and weighs 166g. How Does a Vertical Mouse Help? Evoluent state that a classic horizontal mouse twists your forearm and places it at an awkward positioned. By flipping the mouse on the side, your forearm rests in a more natural and relaxed pose. I’m somewhat skeptical, but only because it follows that the same issues would be present when using a keyboard. Would a vertical keyboard be better? Maybe. I use a Microsoft Sculpt Ergonomic keyboard daily, and it has a slight incline at the center, where it’s about an inch higher than at the sides. Yet Evoluent also sell keyboards, and the only design change there is to move the number pad to the left, so your arm has to travel less to the mouse. They’re otherwise completely flat. You’d think if the horizontal forearm position was so bad, they’d make more of an effort to design a more ergonomic keyboard to compliment the range. (In fact, vertical keyboards are a thing; perhaps they’re heavily patented). I should also note, there’s no medical studies to backup the claims that a vertical mouse is better, so we only have anecdotes of users and reviewers to go on. Clearly, as a guy who makes his living giving anecdotal evidence for why one thing is better than another, I’d like to think we trust that sort of evidence, but take that as you will. The claim sounds logical enough: you can feel the strain yourself just by twisting your arm. Clearly, keeping your arm like that for long periods of time is not good; keeping it in a relaxed vertical should be better. As well as a standard left and right mouse button, you’ll also find a middle button (remember those? ), a scroll wheel, and two thumb buttons. To take full advantage of all those, you’ll need to install the Evoluent drivers. The Mac driver isn’t signed, and as of 10.13 High Sierra, appears to need a permissions override in the Security tab of System Preferences. 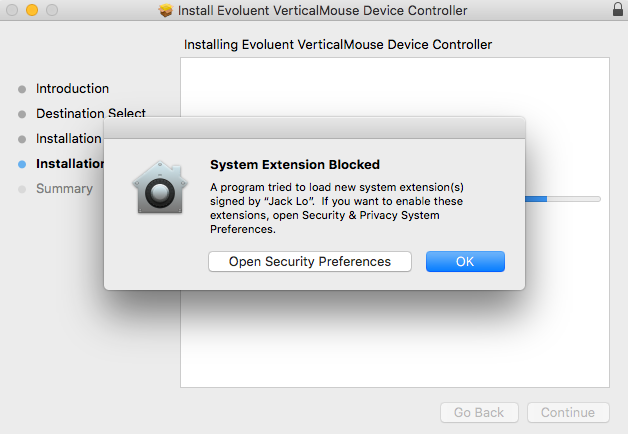 Mac OS warns you about this, and gives you a direct link to the relevant tab, but I found the Allow button didn’t actually do anything until about 30 seconds later. The driver install requires a restart too, which is mildly infuriating. If your machine isn’t equipped with a Bluetooth 4.0 adaptor, you can use the included dongle. It’s a tiny little unobtrusive thing. Once you’re all set up, the additional buttons are powerful, and can be integrated with any standard shortcuts or custom keyboard combinations. After playing around with a few configurations, I setup to the thumb buttons as copy and paste. This is something I do a lot with URLs when editing reviews, so it made sense to put these as one button shortcuts. I use a Microsoft Sculpt Ergonomic keyboard daily for all my typing, so I certainly recognise the value of comfortable input device for extended periods of use. For my pointer needs, I pair that with an Apple Magic Trackpad–the large white slab of frosted glass. While I appreciated being able to use the Evoluent’s extra buttons for some custom shortcuts, I found myself missing the gestures of the Trackpad even more. This was especially noticeable in Final Cut, where zooming in and out, and scrolling horizontally, just weren’t possible without additional keyboard strokes. The Apple Trackpad also has a delightful haptic motor inside, which clicks back at you in supported applications–such as lining things up in Pages or Keynote. Of course, these aren’t complaints aimed at the Evoluent Vertical Mouse. My point is merely that if you’re going to spend $ 100 or so on a new pointing device, and you own a Mac, you might prefer to do away with mice entirely and get the Apple Trackpad, as I did. Since most of my computing is done on the keyboard anyway, the sheer size of the Evoluent Vertical Mouse was a downside for me. I’m so used to just pivoting and sliding my right arm back to the keyboard. With the Evoluent device standing about 8cm high, that just wasn’t possible, and instead required me to lift my arm each time. This sounds inconsequential, but it’s not when you have to do that motion hundreds of times a day. It’s just quite an obnoxiously large obstacle on my way back to the keyboard. So for me, the Apple Magic Trackpad remains superior to the Evoluent Vertical Mouse, outside of gaming. After a week of trying to use the Evoluent Vertical mouse instead, I’m sticking with my big Trackpad. 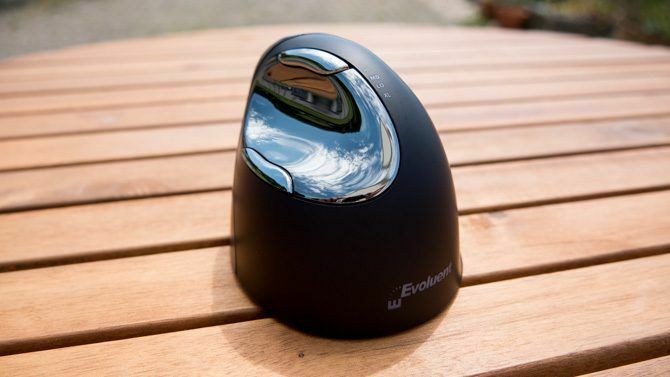 Is The Evoluent Vertical Mouse for You? 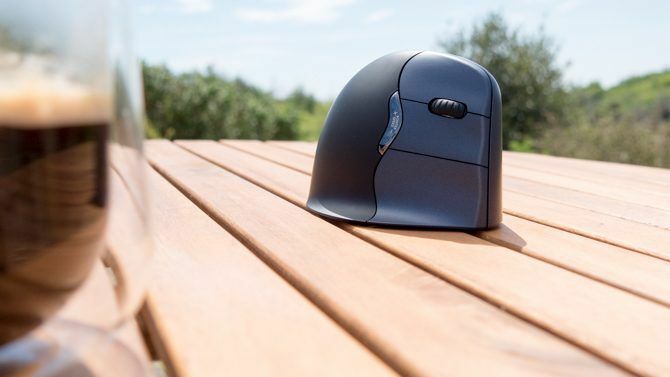 There’s no doubt that the Evoluent Vertical Mouse is a significant step up from regular mice for comfort. Logically, it should reduce long term wrist injuries and arm strain. The vertical design should really be the new standard in mice. It seems so obvious that you wonder why everyone else hasn’t done it already. It’s objectively better, and I shudder to think how many people are just now developing injuries from using a horrid flat mouse on a daily basis. Evoluent aren’t the only manufacturers of a vertical mouse of course, but they are one of the few with genuine Amazon reviews and satisfied users. If you’re suffering from RSI or wrist strain of any kind that you suspect might be due your mouse, try the Evoluent Vertical mouse. I guarantee it’ll be better than the cheap bundled thing you’re using now. Upgrade now and do your wrist a massive favor–you’ll thank me in 20 years. Check out our other computing health tips, too.